Prairie View picked up the biggest win yet in its new stadium while Jackson State remains winless after five games. 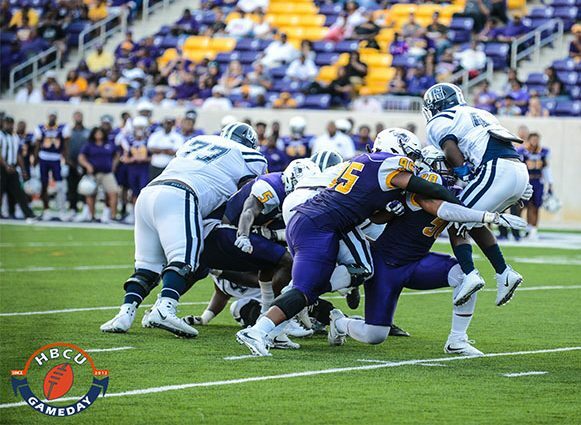 Prairie View, TX– Prairie View A&M University football win enjoyed its biggest win in new Panther Stadium Saturday with a 38-9 win over Jackson State. PVAMU (2-2 overall, 2-0 SWAC) led 17-3 after the opening quarter in leading at halftime for the first time in six games in the new facility, posting its highest scoring output of the season heading into next week’s SWAC Western Division showdown against Grambling in the State Fair Classic. The Panther defense forced five takeaways (four fumbles, one interception) and recorded four sacks in keeping JSU (0-5, 0-2) out of the end zone until just over a minute remaining in the game. LB Jalyn Williams led the Panthers with seven tackles, including a sack, two tackles for loss, and one fumble recovery. He has eight tackles for loss in the past three games. Offensively, PVAMU converted two of the turnovers into points and had a balanced attack (208 rushing yards, 231 passing yards) in gaining 439 yards total offense. QB Lavell McCullers had 258 yards total offense (190 passing, 68 rushing) and two touchdown passes. Dawonya Tucker rushed 12 times for 64 yards and a touchdown.